From time to time I am asked to review products. Most of the time I don't bother with it because most of these products are lame. Every so often, a company making rad products, like Incase, will hit me up and I will gladly take one of their backpacks in exchange for an honest review on Mostly Skateboarding. There had been some delays in my agreeing to do this review which turned out to work in my favor because the Halo Courier Backpack just came out and suited my needs better than any of the other packs available earlier. The Halo Courier is a big backpack, perfect for travel. It's size clocks in just under most airline's carry on dimensions. The 30L main compartment gives you ample space for a long weekend's worth of gear. 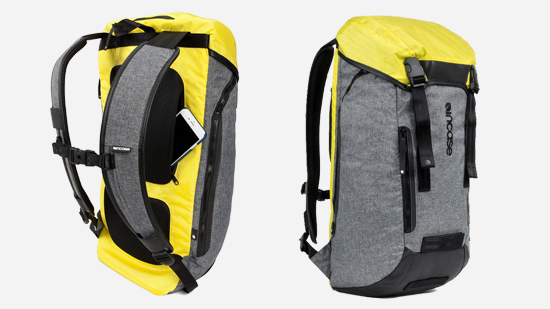 A smart traveler could probably go to Europe for a month with just this pack. There are plenty of stash pockets and organizing schemes to make it easy to find everything. The secret pocket on the back panel would be great for a passport, extra cash, or elicit substances. As with any good bag these days, there is a separate padded laptop compartment which for the past week has taken good care of my MacBook. The big compartment is lined in white making it easy to find what you are looking for deep inside the cavernous main compartment. Incase has a lot of these small, smart features that show Incase is really thinking about the person using the bag. Many of those small design features are aimed at cyclist. There are dedicated straps for bike locks and safety lights plus reflective detailing throughout. It would have been nice to have some board straps too. You can easily carry your board crossways under the lid but doing this repeatedly would likely cause severe wear damage. Beside's the lack of a board specific carrying system, my only other minor complaint is with the straps. They twist quite easily when you put the bag on. This is so minor it is hardly worth mentioning but every morning it frustrates me so it might frustrate you too. If you are looking for a bag for traveling or school this is a great option. It may be a little bit big for daily cruising and commuting. Incase makes great bags and even if the Halo Courier does not become your daily bag it will be a trusty travel companion that will last just about forever. At $249.95, it better.